Small - $180.99 Only 1 left! Tired of Batman and his buddy Robin always stealing the show? For far too long, they have just strolled right into parties, reveling and basking as everyone "oohs" and "ahhs" like they've never seen a superhero before. And the mere sight of them sends thieves scattering into the night and rethinking their life plans (except for the Joker and other big-name evildoers, of course). 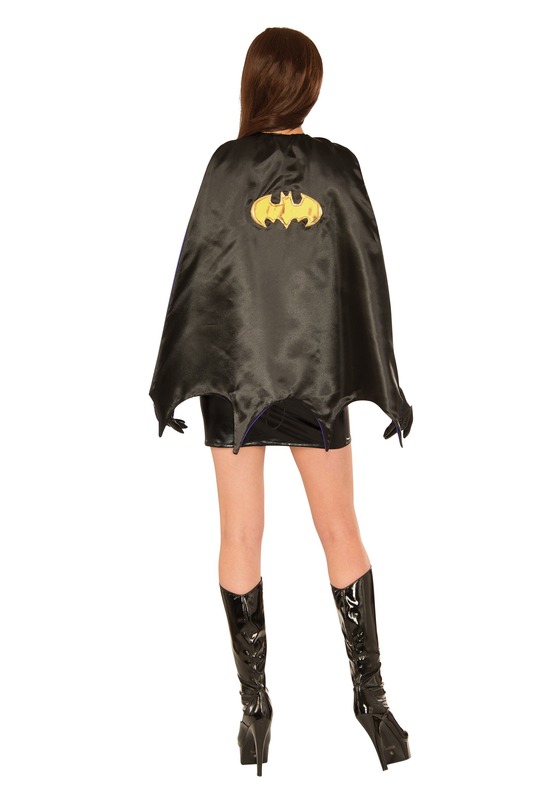 Well, we think it's high time you showed old Bruce Wayne how to really make an entrance this Halloween. In this stylish and formidable Women's Deluxe Batgirl Corset Costume, you're sure to leave your mark on the entire city of Gotham! With an alluring corset and a short skirt (which makes it incredibly easy to deliver devastating roundhouse kicks to the bad guys!) and decked out in black, purple, and gold trim, this getup makes quite the impression. The bat logo on the front is truly an eye-popper, with flashy gold coloring and ruffle trim, and the padded gold belt is like something right out of a comic book splash page. Let's not forget the awesome eye mask, which flares out on both sides for a batwing effect that echoes the golden age of the old Batman comics. And what would a superhero be without a cape? This one has the iconic bat logo on the back, and attaches with velcro around the front in a stylish and eyebrow-raising way. And yep, those sweet elbow-length gloves are also part of the package. You'll never look better fighting crime than in this costume!